DriveSaver DS100 Series Detuned and DS200 Tuned Filters are used to compensate the reactive power in single, standard power devices or groups of motors in networks affected by harmonics. 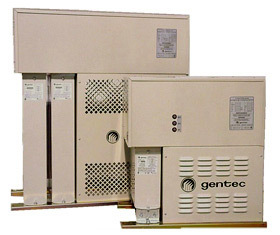 A DriveSaver fixed or automatic consists of a reactor connected in series with the power capacitor unit and switched contactor for the DS100 series II. Using this type of assembly prevents a resonance phenomenon between network inductance and capacitor capacitance. A fixed detuned filter is usually connected in parallel with the device, motor or group of devices that needs to be compensated. The capacitor is switched on and off simultaneously with the motor being corrected. For an individual control of the detuned filter, a contactor (series II) can be separately installed inside the case.